The AccessPoint-Nest is a high quality, high density nest designed to hold any of the AccessPoint family (Dataplex 300 series) of products. This includes all Dataplex designed modems such as the DPX-325-30, DPX-334-01/02 and DPX-368-01/04, DPX-390-01 modems, AccessPoint-Manager, AccessPoint-Controller and AccessPoint-Processor. The AccessPoint-Nest is a high density nest designed to house various communications products. Each device has a telephone network interface and a DB25 V.24 interface. In addition to these standard modem interfaces, each card in the AccessPoint-Nest has a manager interface. This interface consists of a separate serial connection for each slot in the nest to the controller card. The AccessPoint-Nest will accept up to 16 cards in any combination, provided the maximum rating of the power supply is not exceeded. Other features include hot swapping of cards and dual redundant power supplies in both 110/240 volt AC and 48 volt DC versions. Power supplies support load sharing or hot standby. Individual power inlet connections are provided to allow separate power sources. Supports all AccessPoint Products The DPX-300 permits the inclusion of AccessPoint-Manager (Nest Management Software), AccessPoint-Controller (Network Controller Card), and AccessPoint-Processor (Communications Server Card). 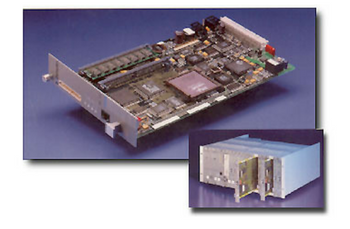 Any Dataplex rack mounted modem may be inserted into a vacant slot. The unit also supports connection of ISDN terminal adaptors. The AccessPoint-Nest integrates all security, configuration and diagnostic requirements into one compact unit. With the AccessPoint-Nest, the Network Manager can support a variety of popular applications needed for dial-in and dial-out access, remote PC and remote control, server functionality and network interconnection. Manufactured under an ISO-9001/AS-3901 quality control system, the Access- Point-Nest offers advanced design.